Today sees the signing an EU association agreement between three former Soviet republics; Ukraine, Moldova and Georgia. This is a milestone in the development of the European Union and is likely to cause tensions with Russia. Viktor Yanukovych famously backed out of signing this very agreement last year, sparking waves of protest. It was essentially the flashpoint which led to the latest Ukrainian revolution. I was in Ukraine in October and never in a million years did I think that things would escalate so quickly and with such tragic consequences. These EU accession agreements are something to celebrate and provide an opportunity for closer economic cooperation and should in theory, foster stronger, more positive international relations. In Ukraine the story is unfolding on a daily basis. Georgia, an EU-aspirant country, has undergone rapid social and economic transformation over the past decade and the signing of this agreement is an important step on the long road to European integration. (They also make rather nice wine too!) Moldova, apparently the poorest country in Europe, stands to gain a foothold in valuable economic markets. For existing EU members this agreement also provides new opportunities for business, investment and dialogue. To celebrate, here are some of my favourite Eurovision tunes from Ukraine, Georgia and Moldova. Happy Friday! Gaitana was a fantastic ambassador for Ukraine in 2012, this anthem of Euro 2012 stood in stark contrast to the allegations of racism which plagued the organisers of the football championship. Gaitana herself faced racist attacks from Ukrainian politicians. She took it all in her stride and belted out her song for Europe. The Georgians are famous for their hospitality and at Eurovision they are by far, the nicest, most welcoming delegation of all. Relative late-comers to the Eurovision party, debuting in 2007, they've entered something different every year. It's this rich diversity which keeps the contest alive. This song from 2010 is one of my absolutely favourites, Sofia was probably the best singer in the contest that year and I was ready to pack my bags for Tbilisi in 2011. Sadly it wasn't to be, what's another year? Good luck to my colleagues Göran and Per who are attending a celebratory event this afternoon at the Ukrainian embassy in Stockholm. Europe's living a celebration! It's a great privilege to be teaching two courses at London's City Lit Academy in August. The first course on Saturday 9th August will focus on the global phenomenon that is ABBA! More details here. The following day, Sunday 10th August, I'll be teaching a day course on Eurovision! More details here. I'd like to thank the City Lit Academy for this opportunity and look forward to working with them this summer! It's just over a month since the final of the 2014 Eurovision Song Contest took place and since Austria's Conchita Wurst romped home to victory. Austria hadn't won the contest since 1966 and the result this year proves that if at first you don't succeed, try and try again. It'll come as little comfort the UK's Molly of course who hoped to fare better than she did. However, we in the UK must acknowledge that we no longer have a monopoly on this competition, and as Austria showed, nobody really does. Conchita's victory was lauded as hugely significant by many, including myself, who saw it as a triumph of freedom of expression. 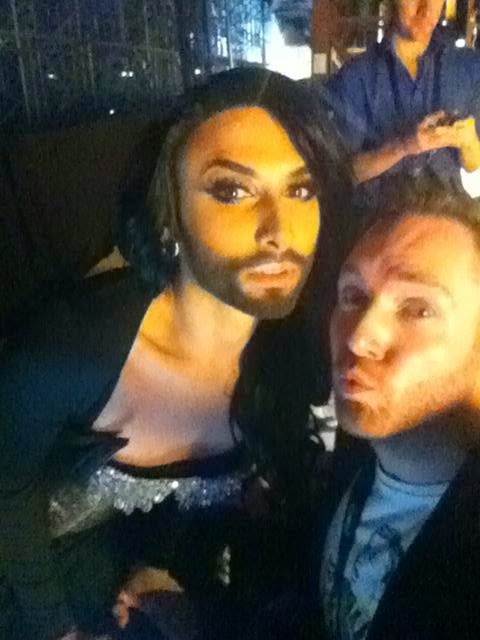 I've said it before, and I'll say it again, Conchita is a drag queen with a beard. Nothing more, nothing less. However in these troubled times, when countries around the world and indeed Europe, are enforcing draconian laws against homosexuality and flouting international legislation concerning human rights, Conchita's victory is significant. I understand that some might not feel comfortable using a bearded drag queen as such a symbol, that's their prerogative. What's interesting is how the result was viewed in other countries. In Russia, unsurprisingly, the government view was one of hostility and dismay. According to Russian politicians, Conchita's victory represented the end of Europe as we know it. There was even talk about them starting their own contest, an Intervision Song Contest with the Russian selection to be held in... Crimea! The results of Eurovision this year showed that people cannot be judged by the actions of their governments; the public in Russia, Ukraine and Georgia all voted for Austria despite their alleged homophobic tendencies. Russia and Ukraine were of course one of the main focal points of the contest, which stands as evidence yet again that Eurovision illuminates wider geopolitical debates in Europe today. Austria's victory in the contest was merely the tip of the iceberg. Austria, a country which doesn't really have any voting allies in the contest, won the contest after nearly 50 years. The Netherlands, which have failed to qualify consistently for nearly a decade, came second. Sweden finished in third position making the 2014 contest the first to have an all-western top three since 1999. In the UK four songs from the 2014 contest charted in the top 40, with the Dutch song entering at number 9, the highest placing for a non-winning, non-UK song for nearly 40 years. The myth that the UK is not interested in Eurovision has surely been dispelled by now? It'll be interesting to watch what Conchita Wurst does in the coming months. She's already appeared on Newsnight and came across as more articulate, intelligent and informed than most of our own politicians. I use the term "she" because Conchita, the character, refers to herself as a she, as do most drag queens. There's no hidden agenda here, something that some UK tabloids should understand. Whilst Conchita's emotionally charged victory speech might be written off as a bit of excitement, I think what she said was hugely significant given all that's happening in Europe just now. It wasn't just aimed at the LGBT community, it applies to any group and as the recent European elections have shown, worryingly there is growing support for those who wish to marginalise others. I salute you Conchita, thank you for the music.